Research on benthic communities in the deep sea has focused largely on habitats in isolation, with few studies considering multiple habitats simultaneously in a comparable manner. The present study aimed to determine the structural differences in benthic communities of continental slope, seamount, canyon, vent, and seep habitats, and assess their relative vulnerabilities to disturbance from bottom trawling and potential seabed mining. Megafaunal invertebrate communities of these habitats were sampled in two regions off New Zealand, in four depth strata between 700 and 1500 m, using an epibenthic sled and a beam trawl. Patterns of community and trophic structure, and the potential influence of environmental variables, were determined using multivariate analyses. The difference in community structure between regions was greater than among habitats and depth strata. Levels of food availability may explain regional differences in community structure, although some influence of fishing disturbance is also possible. Differences in community and trophic structure were most pronounced between the chemosynthetic vent and seep habitats, and other habitats. Differences among these other habitats within a region were inconsistent, except that canyon and slope communities always differed from each other. Community and trophic structural patterns were partly explained by the environmental differences observed among habitats. The relative vulnerabilities of benthic communities to human disturbance in the two regions were determined based on patterns of abundance and feeding mode of the megafauna. Communities of vent and seep habitats were assessed to be more vulnerable to disturbance than those of the other habitats based on a number of habitat-related attributes. However, the relative vulnerability of megafaunal communities at slope, canyon, and seamount habitats could not confidently be assessed on a habitat basis alone. The results of the present study have implications for how regional and habitat differences in benthic communities are incorporated into spatial management options for the deep sea. Research on benthic communities in the deep sea has focused largely on habitats in isolation (e.g., slope, Palma et al., 2005; vents, Desbruyères et al., 2006; canyons, Schlacher et al., 2007; seeps Levin and Mendoza, 2007; seamounts, Lundsten et al., 2009), with few studies considering even two habitats simultaneously in a comparable manner (canyons and slopes: Vetter and Dayton, 1998; e.g., seamounts and slopes: O'Hara, 2007; McClain et al., 2009; slope and seeps, Zeppilli et al., 2012; De Leo et al., 2014; abyssal hills and plain, Durden et al., 2015; vents and seeps, Nakajima et al., 2015). Only relatively recently, has the need to consider biodiversity patterns and the potential linkages between multiple deep-sea habitats been identified and addressed (e.g., Vanreusel et al., 2010; Kelly et al., 2010; Sevastou et al., 2013). The need to understand connectivity between habitats arises not only from scientific interest in obtaining greater ecological understanding of the deep sea, but also from social pressures to generate information for the effective management of the growing industrial use of the deep sea (Ramirez-Llodra et al., 2011). Megafauna (animals > ~3–5 cm in dimension) are a commonly studied component of benthic invertebrate communities in the deep sea, sampled either directly by sleds or trawls, or indirectly by photographic methods. Photographic sampling focuses on the mega-epifauna (seafloor surface dwelling fauna), while direct sampling can include infauna (sediment dwelling) as well as epifauna. Studies of megafaunal communities along continental margins (sampled by sleds and trawls—the focus of this study) have identified the influence of habitat heterogeneity, with variations in environmental parameters such as oxygen, temperature, overlying productivity etc., affecting broad-scale patterns of community structure (species composition and abundance) (e.g., Sellanes et al., 2010; Williams et al., 2010a). Nested within these regional environmental variations along a margin are a range of more localized topographic habitats such as canyons, seamounts, banks, and ridges as well as the open continental slope. Cold seep and hydrothermal habitats also occur on or adjacent to some continental margins (Menot et al., 2010). Studies have shown that these feature-scales of habitat heterogeneity influence the biodiversity patterns (abundance, biomass and diversity) of megafauna on continental margins due to differences in various local environmental factors (e.g., canyon versus open slope—Sardà et al., 1994; Ramírez-Llodra et al., 2008; Vetter et al., 2010; seamount versus slope—Rowden et al., 2010a; Tecchio et al., 2013). However, few studies have determined and reported the level of community similarity (species turnover or β-diversity) among the megafaunal communities that inhabit these deep-sea habitats (Cartes et al., 1994; Ramirez-Llodra et al., 2010; Rowden et al., 2010b), and only one to our knowledge has used community similarity to explicitly assess the degree of connectivity between habitats (Kelly et al., 2010—which included megafauna), and none to assess their potential vulnerability to anthropogenic disturbance. If benthic communities of different habitats in the deep sea are generally dissimilar to one another in terms of community structure, this may indicate that they are relatively unconnected (Kelly et al., 2010). Consequently they may be vulnerable to anthropogenic impacts because they have limited ability to recover via dispersal if disturbed at a habitat-level scale. Faunal dissimilarity among habitats could also indicate that a habitat's environmental characteristics are distinct enough to allow the development of specific communities (Kelly et al., 2010). Some functional or trophic groups within megafaunal communities are particularly sensitive to disturbance, which may result in the community of deep-sea habitats being more vulnerable to disturbance than others if the proportion of these taxa is relatively high or of particular importance for the structure and function of the community. The sensitivity of such organisms may be expressed by a variety of structural, positional, or ecological traits (e.g., Tyler-Walters et al., 2009). Feeding mode is an important trait; for example, megafaunal filter- and suspension-feeders, which are abundant in hydro-dynamically active parts of canyons and seamounts (Genin et al., 1986; Duineveld et al., 2001), are vulnerable to smothering by the gravity flows caused by bottom trawling along canyon edges (Palanques et al., 2006; Martín et al., 2014) or physical impacts from trawling that focuses on the summits of seamounts (Clark and O'Driscoll, 2003; Clark and Rowden, 2009). In New Zealand, deep-sea fisheries are economically valuable but can impact habitats with vulnerable benthic communities (e.g., seamounts: Clark and Rowden, 2009; Williams et al., 2010b; canyons: De Leo et al., 2010; seeps: Baco et al., 2010; Bowden et al., 2013), and the fauna of the open slope (e.g., Cryer et al., 2002). Consumers are becoming more aware of the issues surrounding the sustainability of fisheries, thus research that can inform approaches to balance fisheries exploitation with conservation of vulnerable deep-sea communities are of interest to resource and environmental managers. In New Zealand, a limitation of a previous comparison of fauna among different deep-sea habitats with potential vulnerable communities is that it examined one taxonomic group and depended on the compilation and manipulation of data obtained by different surveys using varying methodologies (Rowden et al., 2010b). Therefore, advances in understanding the similarity of fauna among different deep-sea habitats, and thus their relative vulnerabilities to disturbance, need to come from studies that examine a range of communities across different habitat types using comparable sampling methods. The New Zealand EEZ is an ideal location to conduct such a study because a diverse array of deep-sea habitats occur in close geographical proximity (Gordon et al., 2010), enabling direct comparisons between habitats without the confounding factor of spatial separation. The present study examined the following hypotheses: (1) the benthic communities of deep-sea habitats such as seamounts, vents, canyons, and seeps are structurally and functionally different from each other and from those found on the continental slope; (2) the communities of these habitats are more vulnerable to human disturbance than are those of continental slope environments; and (3) the effects of fishing and potentially other human activities are more severe for these communities than for those on continental slopes. Data collected to address these hypotheses will ultimately inform ecological risk assessment, helping environmental and resource managers to assess and mitigate the threats to vulnerable deep-sea habitats and their communities whilst maintaining sustainable exploitation of resources. The current study focuses on megafaunal communities of deep-sea habitats sampled by benthic sled and beam trawl. This study forms part of a complementary set of investigations conducted under a larger programme. Results for mega-epifauna sampled by towed video camera, and macro-infauna and meiofauna sampled by multicorer and box-corer, have been reported separately (Bowden et al., 2016; Leduc et al., 2016; Rosli et al., 2016). In order to make robust comparisons of benthic communities from different deep-sea habitats, the geographic distance between habitats should be minimized and sampling should occur within a uniform environmental setting. There is no single localized area off New Zealand where all continental margin seabed habitats co-occur, however, so two regions were selected that are each missing only a single, and different, chemosynthetic habitat. These regions are the Hikurangi Margin (slope, canyons, seamounts, and seeps), and the Bay of Plenty (slope, canyons, seamounts, and vents). Sampling of two regions allows a more general evaluation of dissimilarity in benthic community structure observed among the different habitats. The two regions also cover a range of human activities. The Hikurangi Margin has significant fisheries, including for hoki (Macruronus novaezelandiae) and orange roughy (Hoplostethus altanticus) (Clark, 1995), and may be subject to deep-seabed mining for gas hydrates in the future (Fohrmann and Pecher, 2012). The Bay of Plenty also has some deep-sea trawl fisheries, including for orange roughy and alfonsino (Beryx decadactylus) (Clark and O'Driscoll, 2003), and is of deep-sea mining interest for seafloor massive sulfide deposits (Boschen et al., 2013). The Hikurangi Margin is located on the south-eastern coast of New Zealand's North Island (Figure 1). The slope is incised with a number of canyons and there are some physically isolated bank and seamount-like features that occur between the canyons along the general slope (Mountjoy et al., 2009). On some of the broader banks there are active methane seeps (Greinert et al., 2010). The Bay of Plenty is located off the north-eastern coast of New Zealand's North Island (Figure 1). The slope of this region is also incised with canyons, while the seamounts are part of the Kermadec volcanic arc that trends to the north-east (Wysoczanski and Clark, 2012). Some of the seamounts of the Kermadec volcanic arc have active hydrothermal vents (de Ronde et al., 2007). Three sites for each of the habitats common to both regions (slope, canyon, seamount) were selected, as much as possible of similar size, morphology, and close together. Seep habitat sites on the Hikurangi Margin were constrained to the Opouawe Bank in the middle of the study region, while vent habitat sites in the Bay of Plenty were either co-located with the study seamount sites or on seamounts immediately further north on the Kermadec arc (Figure 1). Figure 1. 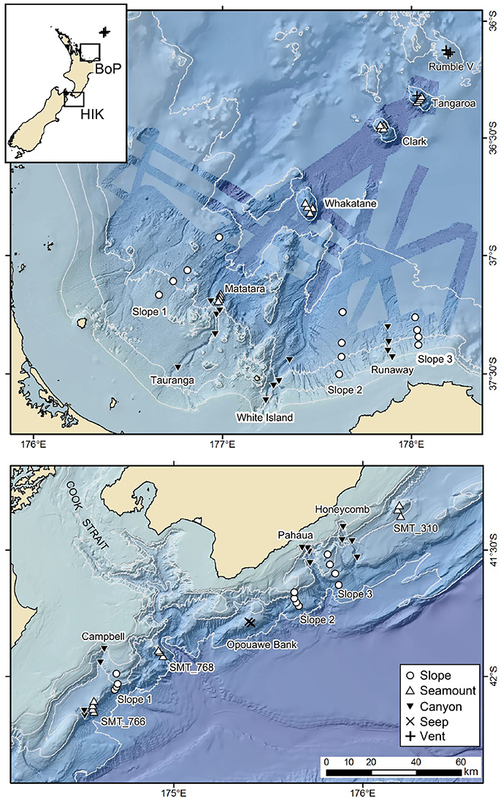 Sampling sites at habitats in the Bay of Plenty (BOP, top) and Hikurangi Margin (HIK, bottom) study regions, and their relative locations off New Zealand (insert; crosses on insert shows location of vent sites at Healy and Brothers seamounts on the Kermadec volcanic arc). Isobaths show 200, 500, 1000, and 2000 m depths. Scale bar applies to both regional maps. See Appendix 1 for sample station details. Sampling of the slope, canyon and seamount habitat sites was conducted during a single survey of each region. Sites on the Hikurangi Margin were sampled from RV Tangaroa in April 2010 (TAN1004), and the Bay of Plenty was sampled in April/May 2012 (TAN1206). Data for seep and vent habitat sites were almost wholly obtained from separate and independent surveys. Data for seep sites on the Hikurangi Margin were obtained from a survey in 2006 (TAN0616) (Baco et al., 2010). One vent habitat site in the Bay of Plenty was sampled during the TAN1206 survey, with data for others obtained from surveys in 2001 and 2011 (TAN0107 and TAN1104, respectively). During the two main surveys, benthic communities at each of the sites for slope, canyon, and seamount habitats were sampled at four depth strata (700, 1000, 1200, and 1500 m). This stratification allowed for the influence of depth effects to be accounted for in statistical analyses, thereby providing a more robust evaluation of any habitat effect. High quality multibeam echosounder data were already available for most of the planned sampling sites but where it was necessary, multibeam transects (using the RV Tangaroa's Kongsberg EM302) were run before sampling commenced. At each sampling site, a towed camera was deployed first to determine substratum type and to record photographic transects before disturbance from physical sampling. Deployment of the sampling gear was planned with direct reference to multibeam maps and observations from the video transects. For predominantly soft substratum, a beam trawl was used to sample megafauna, while on predominantly hard or rough mixed substrata where there was risk of damage to the beam trawl, a sled was deployed. Both gears were towed along the same line as the camera transect. The beam trawl (4 m width, 25 mm cod-end mesh) is a design based on the “Honfleur” fish trawl (Guennegan and Martin, 1985). It was modified using a ground rope with small-diameter (180 mm diameter) rubber disk rollers spaced by 75 mm cookies. This modification was done to enable the trawl to be used on rougher seabed and to reduce the tendency of the net to dig in on muddy substrates. The sled (1 m width, 25 mm cod-end mesh) is of sturdy construction and designed to operate on rough ground, such as found on seamounts (Clark and Stewart, 2016). Both the trawl and the sled were deployed for 10-15 min bottom time. See Supplementary Table 1 for station details. The whole sample from the beam trawl or sled was photographed on deck and then transferred to bins for weighing. Depending on catch volume, either the whole sample or a subsample was then sorted for fauna on a 5 mm mesh sorting table. All fauna were preserved appropriately (ethanol or formalin depending on taxon) except for highly abundant species for which voucher specimens were retained and the bulk discarded. All preserved and discarded samples, together with total catch weights, were recorded in a database and, once ashore, all faunal samples were lodged in the NIWA Invertebrate Collection, Wellington. Samples from the two main surveys were distributed among taxonomists and parataxonomists at NIWA and other institutions in New Zealand and elsewhere (see Supplementary Table 2) for identification to species level where possible, and enumeration (counts of individuals or distinct colonies). Samples from other surveys for which data were used in the community analysis described below were identified by the same people. Using information in Rowden et al. (2010a) and the scientific literature, all taxa were assigned to one of six feeding modes: suspension-feeder; filter-feeder; deposit-feeder; predator/scavenger; grazer, or chemoautotrophic. Some of the feeding mode labels and the taxa assigned to them were revised slightly from those used by Rowden et al. (2010a) for slope and seamount benthos in the southwest Pacific (see Supplementary Table 3 for definitions). Substrate data were obtained from video observations of the camera transects made prior to the deployment of the sled/beam trawl at each site. Substrate types (bedrock, boulders, cobbles, pebbles, gravel, sand, mud and the biogenic substrates “coral rubble” and “shell hash”) were expressed as percentages of the full transect distance after correcting for any sections of the transect in which the seabed could not be observed (e.g., because of high altitude or speed, or seafloor contact) (Bowden et al., 2016). An additional substrate variable (substrate diversity) was calculated based on substrate type data using the Shannon-Wiener diversity index (Etter and Grassle, 1992). Habitats at the study sites were also characterized using seafloor morphology derivatives from multibeam data gridded at 25 × 25 m resolution. The derived topography variables were: depth, slope (steepest gradient to any neighboring cell), aspect (direction of slope), curvature (change of slope), plan curvature (curvature of the surface perpendicular to the slope direction), and profile curvature (curvature of the surface in the direction of slope). Additional derivatives were calculated for the standard deviation of depth, depth range, standard deviation of the slope, and terrain rugosity based on a 3, 5, 7, and 15 grid cell focal mean. For the analysis of megafauna data, topography variables based on the largest grid cell focal mean (i.e., 15 × 15 cells of 25 m or 375 × 375 m) were used, because this spatial scale was closest to the mean length of sled and beam trawl tows (range: 37–1055 m, mean = 516 m). Fishing intensity at each site was obtained from a trawl fishery database maintained at NIWA for the New Zealand Ministry for Primary Industries. This database includes position coordinates of commercial bottom trawls targeting deep water fish species from July 1980 to March 2011. Fishing intensity was defined as the sum of all fishing trawls (either defined as lines or points, the latter when start but not finish location was recorded) intersecting a 2 km radius circle centered on the mid-point of each sled/beam trawl tow (to match the precision of reported fishing trawl trajectories and the length of the sled/beam trawl and video tows) during the 15-year period prior to sampling at that site (the maximum period for which records were available across all sites). The abundance values of four (TAN1206) and three (TAN1004) of the sampling stations were initially based on subsamples of sled/beam trawl catch due to the large amount of material obtained. These abundance values were adjusted to take into account the proportion of material processed relative to the total catch. Abundance of organisms in the samples was then standardized to number of individuals per 100 m2 of seabed, to take account for the difference in dimensions of the gear (see above), as well as the difference in tow length between stations. Preliminary examination of megafaunal datasets showed the presence of unusually high abundance of Hyalinoecia longibranchiata (quill worms) in one beam trawl sample in the Hikurangi Margin region (1630 individuals at station 43, TAN1004). This single datum exceeds all others by about one order of magnitude. Ecological theory suggests that species which are highly clustered should be given less weight in multivariate community analyses than those that are more evenly distributed (Clarke et al., 2006a). Thus, quill worm abundance data for this sample was log(x+1)-transformed to reduce the impact of this outlier on the analyses. Several taxa present in the original megafaunal dataset were removed from final analyses because they were either ill-defined (and could therefore be confused with other taxa; e.g., Amphipods, Cnidaria, Holothuroidea), or pelagic (e.g., Thaliacea, Scyphozoa). Stations where the start, end, and mean tow depths differed from the nominal target stratum depth (four and six stations in TAN1004 and TAN1206 datasets, respectively, see Supplementary Table 1) were re-allocated to appropriate strata prior to conducting analyses to keep the water depth consistent across habitats. One station with a mean water depth of 495 m was on the summit of a seamount that was shallower than the shallowest a priori stratum (700 m) and therefore could not be re-assigned. Data from this station was included in the analysis under the assumption that they would not bias the results. Analyses were conducted using routines in the multivariate software package PRIMER v6 (Clarke and Gorley, 2006). Analyses of community structure were based on Bray-Curtis similarity matrices (Clarke et al., 2006b) of square root-transformed abundance data (Clarke and Warwick, 2001), whereas analyses of environmental variables were based on Euclidean Distance similarity matrices of normalized data. Analyses were run in two stages; the first including data only from the topographic habitats (slope, canyon, and seamount), the second incorporating vent and seep habitats. Megafaunal data from 99 stations were included in analyses of slope, canyon, and seamount habitats. The PERMANOVA routine in PRIMER was used to compare the effects of region, habitat, and depth on benthic community structure (Anderson et al., 2008). PERMANOVA is a semi-parametric, permutation-based routine for analysis of variance based on any similarity measure (e.g., Bray-Curtis). Analyses were conducted using the random factor Region (Bay of Plenty, Hikurangi Margin), and fixed factors Habitat (slope, canyon, and seamount) and Depth (four strata at ~700, 1000, 1200, and 1500 m depth). P-values were obtained using 999 permutations. Because PERMANOVA is sensitive to differences in multivariate dispersion among groups, the PERMDISP routine in PRIMER was used to test for homogeneity of dispersion when significant factor effects were found (Anderson et al., 2008). The square root of estimates of components of variation was used for comparing the amount of variation attributable to the factors in the multivariate PERMANOVA models (Anderson et al., 2008). Lack of independence between sites due to geographical proximity is common in natural communities and presents problems for the interpretation of ecological patterns (Legendre, 1993). Failure to take into account the spatial component of ecological variation may affect tests of statistical significance when investigating relationships between community structure and environmental parameters such as region, habitat, water depth (Legendre and Troussellier, 1988). Thus, Latitude and Longitude were entered as covariates in the PERMANOVA analyses (Anderson et al., 2008). Results of the PERMANOVA analysis were visualized using non-metric multidimensional scaling (MDS) ordinations, with samples symbol-coded for the factors used in the analysis. The SIMPER routine in PRIMER was used to identify the taxa contributing most to differences between regions and among habitats. SIMPER was also used to describe the main environmental variables responsible for habitat differences (using normalized environmental data). In order to examine more directly the potential influence of habitat-related variables on community structure, relationships between megafaunal community structure and environmental variables including trawling were investigated using Distance-based Linear Models (DistLMs) in PERMANOVA+ (Anderson et al., 2008). The DistLM routine is based on an approach called distance-based redundancy analysis (dbRDA) first developed by Legendre and Anderson (1999). Variability in megafaunal community structure was partitioned in DistLM according to the environmental predictor variables detailed above, with latitude and longitude fitted first into the models. Predictor variables that were strongly correlated (R 2 > 0.9) were removed prior to analyses, taking out the variable most weakly correlated with community structure. Marginal tests were initially conducted to examine relationships between each predictor variable and benthic community structure. Sequential tests were then used to determine which variables best correlated with megafaunal community structure (using a step-wise selection procedure with the Akaike information criterion (AIC)) (Quinn and Keough, 2009). P-values were obtained using 999 permutations of raw data. Megafaunal community data from slope, canyon, and seamount habitats from TAN1004 and TAN1206 were compared to those of seep megafauna and vent megafauna from 27 stations based on data from previous surveys. Each seep and vent station was assigned to the nearest depth stratum (700, 1000, or 1200 m) to allow direct comparisons with slope, canyon, and seamount sites. Complete matching between sampling depth strata was not possible for analysis purposes, so instead comparisons had to made using combined “shallow” (700 and 1000 m) and “deep” (1200 and 1500 m) depth strata. The effects of habitat and depth on megafaunal community structure within each region were compared using PERMANOVA, and visualized using a MDS ordination plot. SIMPER was used to identify the taxa contributing most to the among habitat differences in community structure. PERMANOVA analysis was also conducted using trophic structure data (untransformed data) as described above, and the relative representation of trophic groups among habitats was visualized using pie diagrams. No DistLM analyses were conducted as part of the 2nd Stage analysis because it was not possible to obtain matching environmental data for all samples used from seep and vent habitats. The PERMANOVA analysis showed a significant effect of Region on community structure but also significant interactions between Region and Habitat and Region and Depth (Table 1), indicating that the effects of habitat and depth on community structure differed between the two regions. Comparing the estimates of components of variation indicated that the effect of Region (88.7) was about seven times stronger than both interaction effects (12.9 and 13.1). 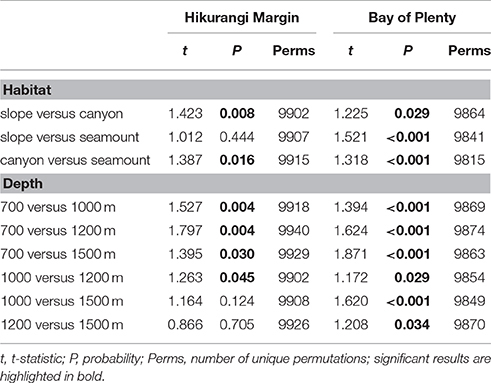 Pairwise comparisons (within Region) showed that, on the Hikurangi Margin, megafaunal community structure in canyons was significantly different from that in both slope and seamount habitats (Table 2) but communities in slope and seamount habitats were not significantly different. In the Bay of Plenty, community structure differed significantly among all three habitats. Communities of most depth strata were significantly different from each other, with the exception of the 1000 and 1200 m versus the 1500 m strata on the Hikurangi Margin (Table 2). Despite high 2-dimensional stress levels, MDS plots illustrate the patterns of community similarity underlying the PERMANOVA analysis: showing a difference in megafaunal community structure between the two study regions (Figure 2A), but a less distinct separation of samples by habitat and depth within each region (Figures 2B–E). Table 1. Results of PERMANOVA analyses testing for the effects of Region (Hikurangi Margin versus Bay of Plenty), Habitat (slope, canyon, and seamount), Depth (700, 1000, 1200, and 1500 m), and their interactions on megafauna community structure, after accounting for the effect of spatial covariates (latitude and longitude; results not shown). Table 2. Results of pairwise PERMANOVA analyses testing for the effects Habitat (slope, canyon, and seamount) and Depth (700, 1000, 1200, and 1500 m) on megafauna community structure in Hikurangi Margin and Bay of Plenty after accounting for the effect of spatial covariates (latitude, longitude; results not shown). Figure 2. MDS ordination plots showing megafaunal community similarity among samples coded for (A) region, (B) habitat, and (C) depth for the Hikurangi Margin region, and (D) habitat and (E) depth for the Bay of Plenty region. SIMPER analysis indicated that dissimilarity between communities in the two study regions was accounted for by small contributions (<2%) by a large number of taxa (Supplementary Table 4). At slope habitats, most of the taxa contributing to dissimilarity between the regions (96%) were more abundant, or were only found at, the Hikurangi Margin. These taxa included Plutonaster knoxi, Zoroaster alternicanthus (asteroids), Gracilechinus multidentatus, Hygrosoma luculentum (echinoids), and Benthodytes (holothuroid). At canyon habitats, taxa characterizing the dissimilarity between regions (93%) were also more abundant or only present at the Hikurangi Margin. These taxa included a diverse range of taxonomic groups e.g., Brissopsis (echninoid), Sipuncula (sipunculid), Bathysiphon (foraminiferan), Amphioplus (ophiuroid), Molpadia musculus (holothuroid), and Eunice (polychaete). For seamount habitat, while most of the taxa contributing to the dissimilarity between regions (96%) were also more abundant or only present at Hikurangi Margin sites (e.g., the asteroids Z. alternicanthus and P. knoxi), there were also some taxa that were notably more abundant or only present at seamounts in the Bay of Plenty. These taxa include Nematocarcinus (caridean shrimp) and Nassarius ephamillus (gastropod). The SIMPER analysis indicated levels of dissimilarity of 86% (slope v canyon), 82% (canyon versus seamount), and 80% (slope versus seamount) on the Hikurangi Margin, and 92, 95, and 96% for the same comparisons in the Bay of Plenty. In all cases, community dissimilarity was accounted for by small contributions of dissimilarity (<2.5%) by a large number of taxa (Supplementary Tables 5, 6). 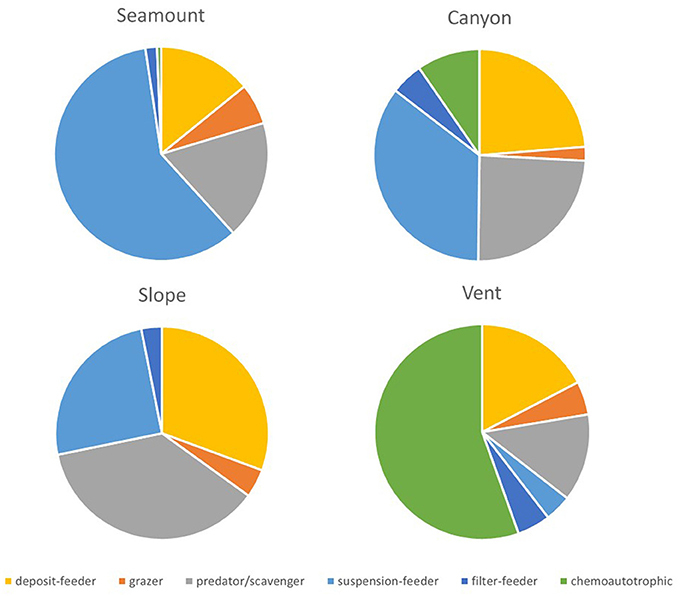 Most of the dissimilarity between habitats resulted from a number of taxa being more abundant or present only at canyon habitats compared to slope or seamount habitats. Taxa in higher abundance in canyon habitats included Bathysiphon, Brissopsis, Sipuncula, and M. musculus on the Hikurangi Margin, and Sipuncula, M. musculus, Spiochaetopterus (polychaete), and Ophiomusium lymani (ophiuroid) in the Bay of Plenty. On the Hikurangi Margin, Sympagurus dimorphus (pagurid), Scaphander otagoensis (gastropod), O. lymani and Benthodytes were more abundant at slope than seamount habitats, while the opposite was observed for Fusitriton (gastropod), M. musculus, Ophiozonella stellamaris (ophiuroid), and Amphioplus. Taxa contributing to the dissimilarity between slope and seamount habitats in the Bay of Plenty included Munida (galatheid), Ophiura (ophiuroid), and Enallopsammia rostrata (scleractinian coral), as well as those two taxa that were noted above as being responsible for regional differences in community structure (being more abundant on seamounts). In slope, canyon and seamount habitats, fishing intensity was higher on the Hikurangi Margin than in the Bay of Plenty, and in both regions fishing intensity was highest on seamounts (Figure 3A). On the Hikurangi Margin, fishing intensity accounted for most of the environmental dissimilarity between seamounts and the other non-chemosynthetic habitats (accounting for 44–58% of environmental dissimilarity between these habitats, SIMPER), whereas in the Bay of Plenty higher substrate diversity and occurrence of cobble and gravel substrates on seamounts accounted for most of the dissimilarity from other habitats (accounting for 17–27% of environmental dissimilarity) (Figures 3B–D). Environmental dissimilarity between slope and canyon habitats on both the Hikurangi Margin and in the Bay of Plenty was mostly due to the standard deviation of the slope (both regions, 11–17% of dissimilarity) and rugosity (Hikurangi Margin only, 11%), both of which were higher at canyon habitat (Figures 3E,F). Figure 3. Fishing intensity and physical characteristics of canyon, slope, and seamount habitats at the Hikurangi Margin (shaded bars) and Bay of Plenty (open bars) regions. (A) Fishing intensity, (B) Substrate diversity, (C) Cobble, (D) Gravel, (E) Standard deviation of slope, (F) Seafloor rugosity. Error bars are standard errors. The environmental variables identified as being the most important in the DistLM marginal tests all featured in the best step-wise (sequential tests) DistLM models. 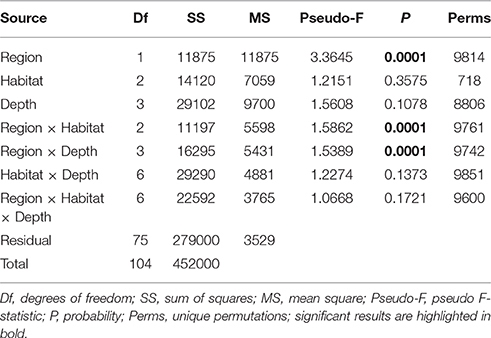 The best DistLM model that included both regions explained 30% of the variance in community structure, and included 13 variables describing substrate and seafloor topography (Table 3). Depth and substrate diversity were the most important variables explaining the difference in megafaunal community structure across the two regions. The best DistLM model for habitats on the Hikurangi Margin explained 37% of the variance and included five variables, with boulders, bedrock, and depth being the most important. 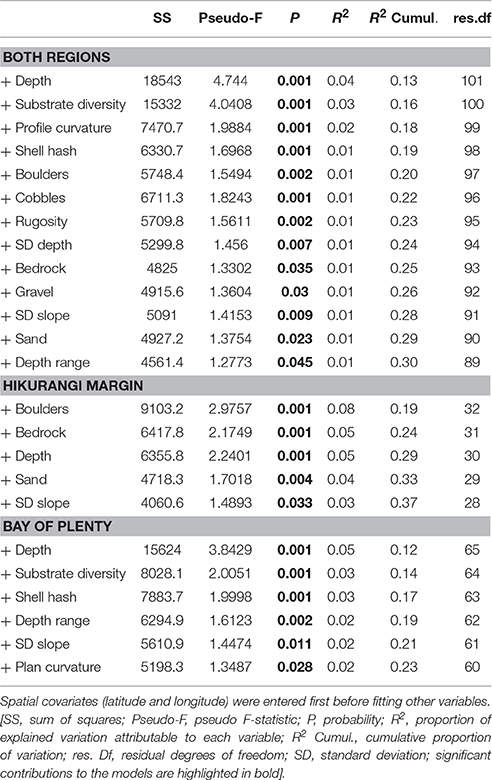 The variables with the highest correlation with community structure at habitats in the Bay of Plenty were depth, substrate diversity and shell hash, which together with three more variables explained 23% of the variance observed in this region. Trawl intensity did not feature in any of the best DistLM models for both or individual regions, despite being significantly correlated with community structure in marginal tests for the Bay of Plenty. Table 3. Results of distance-based linear model (DistLM) analyses showing correlations between predictor variables and megafaunal community structure (sequential tests) for Hikurangi Margin and Bay of Plenty regions combined, and each region separately. The second-stage PERMANOVA analysis showed a Habitat effect in the Bay of Plenty region, with significant differences for all pairwise habitat comparisons except slope versus canyon (Table 4). On the Hikurangi Margin, community structure was significantly different between seep and the other three habitats, and slope and canyon habitats at 700–1000 m depth while at 1200–1500 m depth, where seeps were not present, only the comparison between slope and canyon habitats was significant (Table 4). MDS plots illustrate the patterns underlying the PERMANOVA analysis, showing the dissimilarity of samples from seep and vent habitats compared to those from other habitats within regions (Figures 4A,B). The plot shows that communities at habitats in the Bay of Plenty region are more distinct from one another than those on the Hikurangi Margin, with vent communities being the most dissimilar from those in other habitats. Table 4. Results of pairwise PERMANOVA analyses testing for the effects Habitat (slope, canyon, seamount, and seep or vent habitats) on community structure in Hikurangi Margin and Bay of Plenty regions. Figure 4. MDS ordination plots showing megafaunal community similarity among samples at habitats on (A) the Hikurangi Margin, and in (B) the Bay of Plenty. Community dissimilarity between vents and other deep-sea habitats in the Bay of Plenty at both shallow and deep strata was very high (SIMPER, 97–100%), and the taxa contributing most to this dissimilarity were those endemic to vent habitats: Alvinocaris niwa (shrimp) and Gigantidas gladius (mussel), and Alvincocaris longirostris and Vulcanolepas osheai (barnacle), in the shallow and deep strata, respectively (Supplementary Table 7). Levels of dissimilarity between communities at seeps and the other habitats on the Hikurangi Margin (shallow strata only) were less but still high (89–93%), with the distinguishing taxa being those that mostly occurred in relatively low abundance at seep habitat compared to the other habitats on the margin (e.g., S. dimorphus), rather than the presence of seep endemic megafauna (Supplementary Table 8). Trophic structure did not differ between habitats in the shallow strata on the Hikurangi Margin but was significantly different between canyons and the other topographic habitats in the deep strata. In the Bay of Plenty, trophic structure was significantly different among all habitats in the shallow strata, and between vents and all other habitats in the deep strata (PERMANOVA, Table 5). At the shallow strata in the Bay of Plenty, seamount habitats had the greatest proportion of suspension- and filter-feeding taxa. Canyon habitats also had a relatively high proportion of these two feeding types but communities here also contained a high proportion of deposit-feeders and predator/scavengers, and even some chemoautotrophic taxa. Slope habitats were dominated by deposit-feeders and predator/scavengers but also with a notable proportion of suspension-feeders, while vent habitats were, not surprisingly, dominated by chemoautotrophic fauna (Figure 5). On the Hikurangi Margin, canyon habitats were distinct through having relatively high proportions of deposit-, suspension-, and filter-feeders (Supplementary Table 9). Table 5. Results of pairwise PERMANOVA analyses testing for the effects Habitat (slope, canyon, seamount, and seep or vent habitats) on trophic structure in Hikurangi Margin and Bay of Plenty regions. Figure 5. Mean proportions of feeding groups for megafauna at seamount, canyon, slope and vent habitats in the Bay of Plenty region at the shallow strata (700 and 1000 m). Trophic structure was not significantly different between habitats in the Hikuangi Margin at the shallow strata, so corresponding results are not shown. The principal aims of this study were to determine levels of dissimilarity among megafaunal communities in different deep-sea habitats, and to assess the relative vulnerabilities of these communities to anthropogenic disturbance. Previous studies of deep-sea megafauna among habitats have generally focused on particular taxa (e.g., only decapods) or have included fish as well as invertebrate megafauna, and their study habitats have generally been located at different depths. Analysis methods also differ. For example, initial analysis of faunal communities has sometimes been used to define habitats, rather than using a priori physical habitat identification, and different taxonomic resolution and similarity metrics have been used. This limits direct comparisons between this study and these earlier findings, but nonetheless we have considered the latter in the discussion below whenever they are relevant. The most obvious finding of the present study was that megafaunal communities of the two study regions are significantly different. This difference between regions was greater than those among habitats or depth strata, with many taxa contributing across all topographic habitats. Rowden et al. (2010b) observed a regional difference in deep-sea squat lobster communities (sampled by sled, dredge, and trawl) that was also greater than dissimilarity among habitats, with levels of community dissimilarity among regions between 87–100% (Rowden unpublished data.). Generally, fauna characterizing the habitat difference between the two study regions were more abundant on the Hikurangi Margin than in the Bay of Plenty. Differences in food availability between the two regions, indicated by higher levels of surface water chorophyll and sediment chlorophyll/phaeopigment concentration on the Hikurangi Margin (Leduc et al., 2016; Rosli et al., 2016), are likely to be mainly responsible for this observed pattern. Food availability is a major driver of structure in deep-sea benthic communities at regional scales, where elevated levels (up to a point) increase the overall faunal abundance and relative abundance of particular taxa (Levin et al., 2001; Smith et al., 2008). Rowden et al. (2010b) also attributed the regional differences they observed in squat lobster communities to the relative levels of particulate organic matter flux to the seafloor (another proxy for food availability). In the present study, substrate diversity was also markedly different between regions, being greater at canyons and seamounts in the Bay of Plenty, and at slopes in the Hikurangi Margin region. Substrate diversity has been used to explain megafaunal community structure in previous studies; heterogeneous substrates can provide a larger number of niches to be occupied by fauna and thereby influence the community composition (e.g., on seamounts, Raymore, 1982). Usually, community structure is related to habitat heterogeneity at relatively small spatial scales, and this is confirmed by the finding that substrate diversity (after depth) was the most important variable explaining differences in community structure among all samples. However it is possible that the regional-scale differences in substrate diversity could partly explain the levels of community dissimilarity observed between the study regions. Other factors could also be responsible for the difference in community structure across habitats in the two regions. Fishing intensity was consistently and markedly higher (12–114 times) on the Hikurangi Margin than in the Bay of Plenty. While fishing was measured simply as the total number of trawls at a site in a 15-year period before sampling, together with what is known about the history of trawling for the region (authors unpublished data), it is an indication that many places on the Hikurangi Margin are probably chronically disturbed by bottom trawling. Benthic communities at trawled habitats are often characterized by relatively few megafaunal taxa but with high abundances of some opportunistic species that are able to survive and flourish under chronic disturbance (Ramsay et al., 1996; Collie et al., 1997). Thus fishing disturbance could partly explain the generally higher abundances observed at slope, canyon and seamount habitats on the Hikurangi Margin compared to the Bay of Plenty (Supplementary Table 4). Megafaunal community structure on the Hikurangi Margin was significantly different only between canyon and both slope and seamounts habitats, whereas in the Bay of Plenty it differed among all three habitats. These differences among habitats were generally consistent across all depth strata, and levels of community dissimilarity among habitats were generally high: 80–86 % on the Hikurangi Margin and 92–96% in the Bay of Plenty. Although not directly comparable, levels of community dissimilarity observed among habitats in previous studies have generally been lower. Cartes et al. (1994) examined megafaunal decapod crustaceans sampled by trawl at open slope and canyon habitats on the northwestern margin of the Mediterranean Sea (off Spain), and found that community dissimilarity between canyon habitat (430–515 m) and the slope habitats (~250–700 m) was 43–60% in autumn and 64–85% in spring. In a study that compared squat lobster communities from different deep-sea habitats in the southwestern Pacific Ocean, Rowden et al. (2010b) observed significant differences between seamount and rise and ridge habitat (in some regions), but not between seamounts and slope and plateau habitats at comparable depths. Levels of dissimilarity among significantly different habitat communities ranged from 53 to 92% (Rowden unpublished data). Ramirez-Llodra et al. 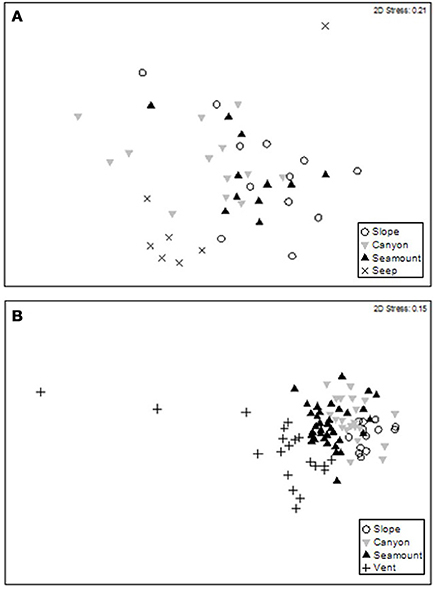 (2010) compared community similarity of megafauna (including fish) sampled by trawl among two canyon sub-habitats (head and wall) and open slope habitat (samples from different times of the year, but analyzed together). Community structure was significantly different between the three habitats (Ramirez-Llodra et al., 2010) but with levels of dissimilarity among habitats ranging between 40 and 48% (Ramirez-Llodra pers comm.). Kelly et al. (2010) compared community similarity of deep-sea habitats in the Gulf of Maine (northeast USA/Canada), using presence-absence data that included megafauna sampled by trawls. Comparisons among habitats were not controlled for depth, so dissimilarity values might be expected to be higher than those observed in the present study. Generally, habitats that were further apart had highly dissimilar fauna (>90%: shelf edge and channel versus rise and seamount), whereas those habitats that were physically closer had a less dissimilar fauna (62–75%: shelf versus channel, canyon versus slope, seamount versus rise). Overall, these comparisons indicate that megafaunal communities of deep-sea habitats can vary considerably, and where levels of dissimilarity are high, habitats may not be well connected. However, high dissimilarity among habitats is not always found. Canyon habitats were distinguished from slope and seamount habitats in both regions by a range of taxa that were either present in higher abundance in canyons, or were absent from other habitats. Some of these more abundant taxa differed between the two regions, reflecting the regional differences discussed above but others were the same in both regions and, thus, likely to be more revealing of the reason for the differences among canyons and other habitats. 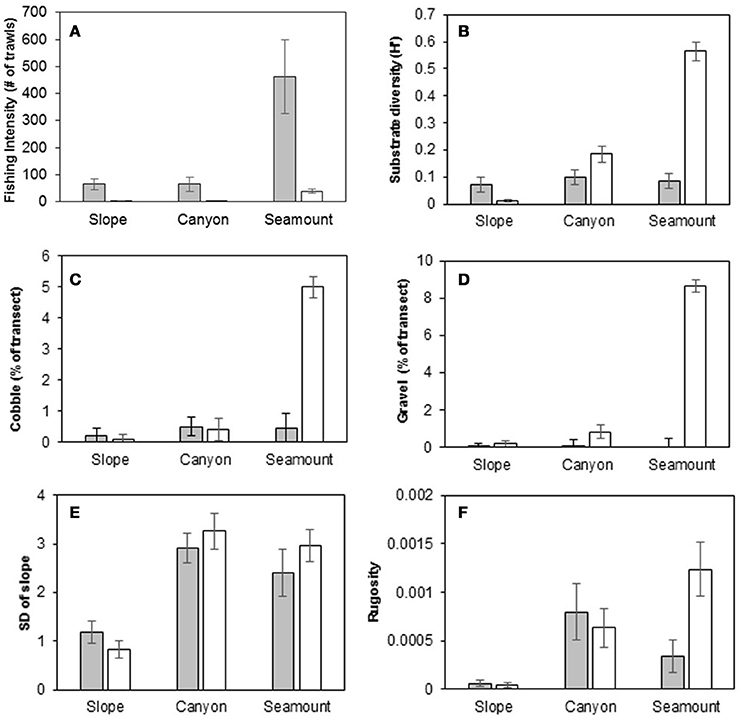 Sipuncula and M. musculus are both infaunal deposit feeders and their higher abundances in canyon habitats probably reflect the elevated levels of organic matter that can occur in canyons, and which have been observed previously to support high densities of these types of deposit-feeding organism in a New Zealand canyon (De Leo et al., 2010). Differences in community structure between canyon habitats and other habitats in both regions could also be related to the higher topographic complexity of the seafloor at canyons (indicated by higher values of the SD of the slope, and rugosity), as suggested by Schlacher et al. (2007) as a reason for the distinct nature of megafaunal communities in canyons. Soft sediments are generally more prevalent on continental slopes than on seamounts, and seamounts in the Bay of Plenty had much higher coverage of hard substrates such as cobbles and gravel, and higher substrate diversity. The latter, together with shell hash, another category of hard substrate, were two of the environmental variables that explained the most variability observed in community structure in the Bay of Plenty. Taxa that contributed to differences between slope and seamount communities in this region reflect the differences in substrate type. M. musculus and O. lymani are associated with muddy or sandy soft sediments (Grassle et al., 1975) and were more abundant in slope habitats. In contrast the taxa that were more abundant at seamount than slope habitat in the Bay of Plenty, and contributed to the observed dissimilarity, included those that are more often associated with hard or mixed substrates (E. rostrata, Munida, N. ephamillus, Ophiura, Nematocarcinus (see similar taxa in Howell et al., 2010a). The lack of a difference in community structure between slope and seamount habitats on the Hikurangi Margin could reflect the sedimentary nature of seamounts on that margin, and their structural similarity to slope habitat in that region (Bowden et al., 2016). It is not surprising that megafaunal communities at vent and seep habitats were found to be different from those at other deep-sea habitats. However, the extent of this difference between chemosynthetic-based communities and those of surrounding deep-sea habitats is rarely determined in a comparable manner, and levels of dissimilarity are rarely reported. In the present study, levels of dissimilarity between vent and seep communities and those at other deep-sea habitats ranged between 97–100% and 89–93%, respectively. This difference between the two chemosynthetic-based habitats probably reflects differences in both environmental characteristics of vents and seeps and their associated chemoautotrophic fauna. Benthic communities at the more heterogeneous seep habitats have been shown previously to consist of a greater proportion of “background” fauna than those communities associated with the more discrete vent habitats (Bernardino et al., 2012) and the main megafaunal chemoautotrophic species at seeps on the Hikurangi Margin are either wholly or partially infaunal (Baco et al., 2010), and thus have lower catchabilities in sleds and trawls than the predominantly epifaunal taxa associated with vents. The present analysis showed that differences in communities between seep and other habitats were largely explained by lower abundances of taxa that are more common at the other habitats, rather than presence of seep-endemic taxa. Similarly, the present analysis supported the expectation that the dissimilarity between vent communities and those of other deep-sea habitats was mostly determined by the presence of vent-endemic taxa. The dissimilarity between communities at seep and vent habitats themselves was almost 100%, which is comparable to the highest levels of dissimilarity observed between megafaunal communities at seeps and vents in the northwest Pacific (off Japan). Nakajima et al. (2015) identified three vent and five seep communities in this region, with community dissimilarity levels between the two types of habitat ranging from 85 to 100%, being highest when the two habitats were relatively distant (geographically and/or bathymetrically) (Nakajima pers. comm.). The vent and seep habitats compared in the present study are also geographically distant, and seep sites were not as deep as some of the vent sites. Not surprisingly, the analysis for differences in trophic structure among all habitats demonstrated the dominance of the chemoautotrophic feeding group at vent and seep habitats, but this group was relatively more dominant at vent than at seep habitats (Supplementary Table 9). This observation is partly related to the physical characteristics of the two habitats (see above), but also by the differences in the chemicals and fluid regime at seeps and vents. Benthic communities at seep habitats have been shown to consist of heterotrophic or partly heterotrophic fauna, as well as the specialized chemoautotrophic fauna (Levin et al., 2003), whereas, heterotrophic fauna are less common in the more toxic vent habitats (Bernardino et al., 2012). Community structure in canyons was also significantly different from that on the slope at both shallow and deep strata on the Hikurangi Margin. As noted in the previous section, this is probably the result of the relatively higher food availability, more complex topography, and availability of hard substrates in canyons compared with slopes. Trophic structure differed between these two habitats, but only at the deep strata, where canyon habitats had a higher proportion of deposit-, suspension-, and filter-feeding taxa than slope habitats, while the latter had a larger proportion of grazers and scavengers/predators. As already noted, deposit feeders are likely to be particularly common in canyons where organic matter accumulates, while sessile megafauna that attach to the hard substrates found on the canyon walls can occur in relatively high abundance benefitting from increased food availability and delivery resulting from canyon-associated hydrodynamic features such as upwelling (Duineveld et al., 2001). The dominance of the other feeding groups at slope habitats could relate to the homogenous nature of the slope substrate providing a more extensive habitat over which the typically mobile grazers, scavengers and predators can search to find food. In the Bay of Plenty, however, this difference between communities in canyon and slope habitats was not seen, while there was a significant difference between slope and seamount communities at both depth strata. The latter finding is probably the result of the contrasting substrate conditions between slope and seamounts in this region, and analysis of the trophic structure of the megafaunal communities supports this finding, indicating that seamount habitats had the greatest proportion of suspension- and filter-feeding taxa, and although suspension-feeders were also present on slopes, communities at this habitat were dominated by deposit-feeders and predator/scavengers. Seamounts are typically dominated by hard substrates that provide habitat for sessile suspension and filter-feeders, such as corals and sponges (Samadi et al., 2007). Benthic fauna in these trophic groups can occur in high abundance on seamounts, particularly where the morphology of seamounts influences hydrodynamic conditions that enhance food delivery to suspension and filter-feeders (Genin et al., 1986). The seafloor at slope habitats, as already noted, is predominantly composed of soft sediment, which is why deposit-feeders dominate the megafauna found at this habitat in the Bay of Plenty. The relatively high proportion of predators/scavengers in slope habitats could relate to the homogenous slope substrate providing a more favorable habitat for such mobile taxa. Differences between the two study regions were driven largely by changes in abundances of many taxa, indicating the two regions share overlapping species pools. An implication of this is that they might have similar vulnerabilities to disturbance. However, the more abundant populations on the Hikurangi Margin, where food availability is higher, are likely to be less vulnerable than less abundant populations in the Bay of Plenty. Vulnerability will vary with the ecological characteristics of different taxa (e.g., Tyler-Walters et al., 2009), but assuming a constant mortality rate following the onset of a disturbance, and similar distributional extent, less abundant populations are more likely to become locally extinct than more abundant populations, thus requiring more immigration from undisturbed areas to return to pre-disturbance levels. Recovery from disturbance depends largely on availability of colonizers, which consist mainly of motile adults from adjacent undisturbed areas during the initial recovery phase, but also planktonic larvae during later recovery (Zajac and Whitlach, 1991), which in turn is influenced by population size. Elevated food availability also increases population growth (Sibly and Hone, 2002), thereby accelerating recovery of benthic communities following disturbance. Therefore undisturbed megafaunal communities in the Bay of Plenty may be more vulnerable to human impact than Hikurangi Margin communities despite being characterized by the same taxa. However, as noted above, it is possible that the higher abundances of some fauna on the Hikurangi Margin could be as a result of chronic disturbance from bottom trawling. Chronically disturbed communities may be more vulnerable to disturbance if they are close to a threshold/tipping point that precipitates an alternate community state (Hewitt and Thrush, 2010). The distinct nature of communities in vent and seep habitats, makes them potentially more vulnerable to disturbance than those at slopes, canyons and seamounts. Vent-endemic taxa can only recover from human disturbance through larval recruitment from other vent habitats. Vent communities can recover relatively rapidly from catastrophic natural disturbances (e.g., Tunnicliffe et al., 1997) because the larvae of many vent-endemic taxa disperse widely (e.g., Marsh et al., 2001; Levin et al., 2016). However, recovery can also be slow where populations of chemoautrophic vent fauna depend on local source populations for their long-term maintenance in a region (Metaxas, 2011). For example, populations of the vent mussel G. gladius (one of the characterizing species of communities at vent habitats in the present study) appear to depend on a source population on Rumble V seamount (Boschen et al., 2015), which means that individual vent communities may be more vulnerable to disturbance than simple recovery models for vent communities predict. Communities at seep habitats were not as dissimilar as those at vents were from the other deep-sea habitats, thus they may be less vulnerable to disturbance. The characterizing taxa of seep habitats included taxa that were found in adjacent habitats, and hence the other habitats (assuming they are not also disturbed) can act as a colonizing source of such fauna. However, seep communities also possess chemoautotrophic fauna, which like vent-endemic fauna, depend on larval recruitment from other seep habitats for recovery following disturbance. Some characteristic seep taxa are only found at seep habitats, while others are also found at other reducing environments such as highly reduced organic muds, and wood, kelp, and whale falls (e.g., Bernardino et al., 2012). This means that the pool of potential colonizers for a disturbed seep habitat may be greater than for a disturbed vent habitat. Seep and vent habitats are also relatively small in extent and thus the more localized communities may be more susceptible to impacts from human activities than the larger slope, canyon, and seamount habitats. That is, the scale of the disturbance will likely be more concentrated, and the fauna of patch or island-like habitats are particularly prone to extinction from disturbance impacts because of their relatively small population sizes and the source of colonizers for a population to recover will almost all have to come from a distant and non-contiguous source habitat (if the site is not part of a local “field” of such habitats) (Hanski, 1999). In the New Zealand context, the benthic communities of seep and vent habitats will also be more vulnerable to disturbance because they occur within a relatively small biogeographic province (Baco et al., 2010; Rogers et al., 2012) compared to the other deep-sea habitats which occur within a much broader biogeographic province (Watling et al., 2013). Thus, the species pool of potential colonizing fauna following disturbance is much larger for slope, canyon and seamount communities than for those of seeps and vents. Levels of community dissimilarity were also high when just comparing among megafauna at canyon, slope and seamount habitats, but the relative values were not the same between pairs of habitats in each study region. This finding means that relative vulnerability of deep-sea habitats to anthropogenic disturbance cannot be consistently defined by habitat type using levels of observed dissimilarity. Furthermore, community structure and trophic structure were not always significantly different, which further suggests that the vulnerabilities of megafaunal communities of some deep-sea habitats are likely to be similar (for example, slope and seamount communities on the Hikurangi Margin). However, community structure at canyon habitats was always significantly different from those at slope and seamount habitats, and trophic structure was also significantly different at this habitat at shallow depths in the Bay of Plenty (when also comparing vent and seep habitats) and at greater depths on the Hikurangi Margin. Canyon communities were characterized by an abundant megafauna, many taxa of which were also found at other habitats in lower abundances. Thus, canyon communities may have the ability to recover more quickly from disturbance than slope and seamount communities. Furthermore the higher complexity of the seafloor topography observed at canyon habitats could make bottom trawling difficult and provide refuges for megafauna from such disturbance. Seamount habitats can also have a diverse substratum that could provide similar refuges from disturbance (Williams et al., 2010b), and the communities of canyons, like the seamounts, had a high proportion of suspension- and filter-feeding taxa (e.g., stony corals), which previous studies have shown to be vulnerable to disturbance by bottom trawling (Althaus et al., 2009; Clark and Rowden, 2009). Thus, the results of the present study demonstrate that it is not straightforward to assess the relative vulnerability of megafaunal communities at canyons, slopes and seamounts on a habitat basis alone. If deep-sea habitats in different regions (separated in the case of the present study by about 500 km) are not equally vulnerable to disturbance from human activities, it has implications for the design of spatial management measures to protect biodiversity. Design guidelines for the distribution of marine protected areas (MPAs) generally recommend a regional approach, but this is based on the need to represent biogeographic differences in benthic fauna (e.g., Roberts et al., 2003). The results of the present study suggest that such guidelines should consider more than just differences in the species pool of an area. For example, the megafaunal communities of deep-sea habitats in the Bay of Plenty, despite sharing most species with the Hikurangi Margin, are considered by our assessment to be more vulnerable to disturbance than those on the Hikurangi Margin—an assessment affected by patterns in abundance and feeding mode. The two regions are already subject to different impacts from fishing—with higher bottom trawl intensity on the Hikurangi Margin than in the Bay of Plenty. Thus it is probable that megafaunal communities at deep-sea habitats in the former region are already impacted (Cryer et al., 2002; Bowden et al., 2013). Although communities in regions that have already been chronically disturbed may also require protection (especially if believed close to an ecological tipping point), in general there is a greater need to afford protection on a regional basis to relatively un-impacted benthic communities—e.g., in the Bay of Plenty. Such protection in a region is particularly important where future disturbance could occur, or where the nature and extent of a new source of human disturbance could be different. The threat of disturbance from future seabed mining or drilling is potentially similar in the two regions (see Introduction, and below), and this potential should also be considered in the design of spatial management measures. The evaluation of faunal vulnerability here is not a formal risk assessment, which would involve consideration of a more detailed range of sensitivity and recoverability traits (e.g., Hewitt et al., 2011). Nevertheless, megafaunal communities of vent and seep habitats were assessed to be more vulnerable to disturbance than those of slope, canyon and seamount habitat because of the potential limited ability of chemoautrophic taxa to recolonise areas after disturbance, the more localized nature of seep and vent habitats, and their smaller-scale biogeography. These factors suggest that chemosynthetic-based communities may require a different form of spatial management to that which could be employed to protect some other forms of deep-sea habitats. This distinction has already been recognized, and specific guidelines (the “Dinard Guidelines”) exist to help design spatial protection measures for these ecosystems (Van Dover et al., 2012). The majority of vent habitats in New Zealand waters are already included in Benthic Protection Areas (BPAs) (Helson et al., 2010), or Seamount Closure Areas (Brodie and Clark, 2003) that prohibit the use of bottom trawling, and some of these sites may soon receive further protection through inclusion in the proposed Kermadec Ocean Sanctuary (http://www.mfe.govt.nz/marine/kermadec-ocean-sanctuary). However, these protected sites have not been selected according to the “Dinard Guidelines,” and some vent habitats in the Bay of Plenty region remain exposed to the impact of any future seabed mining for SMS deposits. None of the more than 30 seep habitats that have been found on the Hikurangi Margin (Greinert et al., 2010) are protected by BPAs, and an impact on benthic community structure from trawling has already been observed (Baco et al., 2010; Bowden et al., 2013), which could potentially be compounded by future drilling for gas hydrate deposits (Bowden et al., 2013). Thus, in a New Zealand context, seep habitats on the Hikurangi Margin are in particular need of consideration for protection, and this should be undertaken according to the guidelines designed specifically for chemosynthetic ecosystems. The assessment of communities from slopes, canyons and seamounts concluded that topographic habitat type by itself might not be a particularly useful basis on which to determine relative vulnerability to anthropogenic disturbance, and hence to design spatial management measures. Designing a network of MPAs according to classifications of topographic habitat type has been advocated (e.g., for deep-sea habitats off Australia, Harris, 2007), but the lack of a reliable distinction between megafaunal communities of such habitats raises questions about the general utility of this approach (this study, O'Hara et al., 2008; Williams et al., 2009; Howell et al., 2010b). The identification of habitat type is, nevertheless, a useful first stage in the spatial management process (for example, it can indicate where sensitive fauna are more likely to occur), but more detailed site-specific assessments of the composition, abundance, and relative vulnerability of communities at deep-sea habitats are required to design the most effective spatial management measures within any region (Howell et al., 2010a). AR contributed to the design of the study, data analysis, and report writing. DL contributed to the design of the study, data collection, data analysis, and report writing. MC contributed to the design of the study, data collection, and report writing. DB contributed to the design of the study, data collection, and report writing. This study is part of NIWA research project Impact of resource use on vulnerable deep-sea communities funded by the New Zealand Ministry for Business, Innovation and Employment (CO1X0906). The study also represents part of NIWA's contribution to GNS research project Harnessing New Zealand's Gas Hydrate Resources (CO5X1204), funded by the same ministry. We thank the officers, crew and scientific personnel of RV Tangaroa voyages TAN1004 and TAN1206, the principal sampling voyages of this project, as well as those that took part in voyages that were the source of additional data—TAN0107; TAN0616; TAN1104. Funding for these latter voyages was provided by the former New Zealand Foundation for Research, Science and Technology (CO1X0028), NOAA Ocean Exploration (NA17RJ1231 and NA050AR417076), and Land Information New Zealand (also CO1X0906), respectively. Thanks to Owen Anderson and Arne Pallentin (both NIWA) for processing the trawl effort data and multibeam data, respectively. We are also grateful for the unpublished data on levels of community similarity supplied by Eva Ramirez-Llodra (NIVA, Norway) and Ryota Nakajima (formally of JAMSTEC, Japan). Particular thanks to Kareen Schnabel and Sadie Mills of the NIWA Invertebrate Collection who organized the curation and distribution of samples for identification. Lastly we acknowledge the crucial contribution of the many taxonomists and parataxonomists who identified the megafauna (see Supplementary Table 2 for their names and affiliations). Brodie, S., and Clark, M. (2003). “The New Zealand Seamount Management Strategy – steps towards conserving offshore marine habitat,” in Aquatic Protected Areas: What Works Best and How Do We Know? Proceedings of the World Congress on Aquatic Protected Areas, Cairns, Australia, August 2002, eds J. P. Beumer, A. Grant, and D. C. Smith (Cairns: Australian Society of Fish Biology), 664–673. Clark, M., and O'Driscoll, R. L. (2003). Deepwater fisheries and aspects of their impact on seamount habitat in New Zealand. J. Northwest Atl. Fish. Sci. 31, 441–458. Clark, M. R. (1995). “Experience with the management of orange roughy (Hoplostethus atlanticus) in New Zealand, and the effects of commercial fishing on stocks over the period.1980–1993,” in Deep-Water Fisheries of the North Atlantic Oceanic Slope, ed A. G. Hooper (Alphen aan den Rijn: Kluwer), 251–266. Clarke, K. R., and Warwick, R. M. (2001). Change in Marine Communities: An Approach to Statistical Analysis and Interpretation. Plymouth: PRIMER-E Ltd.
Guennegan, Y., and Martin, V. (1985). “Annexe 3. Techniques de prélèvement,” in Peuplements Profonds du Golfe de Gascogne, eds L. Laubier and C. Monniot (Brest: IFREMER), 571–575. Hanski, I. (1999). Metapopulation Ecology. Oxford: Oxford University Press. Harris, P. T. (2007). “Application of geophysical information to the design of a representative system of marine protected areas in southeastern Australia,” in Mapping the Seafloor for Habitat Characterization, eds B. J. Todd and H. G. Greene (St. John's, NL: Geological Association of Canada), 463–481. Hewitt, J., Julian, K., and Bone, E. K. (2011). Chatham–Challenger OceanSurvey20/20 Post-Voyage Analyses: Biotic Habitats and their Sensitivity to Physical Disturbance. New Zealand Aquatic Environment and Biodiversity Report. Ministry of Fisheries, Wellington. Menot, L., Sibuet, M., Carney, R. S., Levin, L. A., Rowe, G. T., Billett, D. S. M., et al. (2010). “New perceptions of continental margin biodiversity,” in Life in the World's Oceans: Diversity, Distribution, and Abundance, ed A. D McIntyre (Chichester: Wiley-Blackwell), 79–101. Quinn, P. Q., and Keough, M. J. (2009). Experimental Design and Data Analysis for Biologists. Cambridge: Cambridge University Press. Raymore, P. A. (1982). Photographic investigations on three seamounts in the Gulf of Alaska. Pac. Sci. 36, 15–34. Samadi, S., Schlacher, T. A., and Richer de Forges, B. (2007). “Seamount benthos,” in Seamounts: Ecology, Fisheries, and Conservation, eds T. J. Pitcher, T. Morato, P. J. B. Hart, M. R. Clark, N. Haggan, and R. S. Santos (Oxford: Blackwell), 119–140. Wysoczanski, R., and Clark, M. R. (2012). “Southern Kermadec Arc –Havre Trough geohabitats,” in Seafloor Geomorphology as Benthic Habitat: GeoHab Atlas of Seafloor Geomorphic Features and Benthic Habitats, eds P.T. Harris and E. K. Baker (London: Elsevier Insights series. Elsevier), 853–867. Copyright © 2016 Rowden, Leduc, Clark and Bowden. This is an open-access article distributed under the terms of the Creative Commons Attribution License (CC BY). The use, distribution or reproduction in other forums is permitted, provided the original author(s) or licensor are credited and that the original publication in this journal is cited, in accordance with accepted academic practice. No use, distribution or reproduction is permitted which does not comply with these terms.